On the spur of the moment we shot over to Pompano Beach today to check out the new splash pad at A1A & Atlantic It is really cute and we enjoyed it. There is a huge artificial grassy area right next to it. It really looks beautiful. The pad itself is on the small side and while it was fine for my relatively calm 5 year old, I think it might get kind of rough with many older kids. My big complaint about it is there is no fence or barriers between the street and area. I saw more than one Mom racing to catch a running 18 month old before they could get out to the street. Every Mom knows how fast they can be at that age. If you think you are going to sit in the shade and watch your child play, think again. 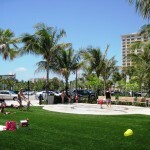 There is very little shade provided by the beautiful palms that encircle the area, and the artificial turf prevents you from sticking beach umbrellas in the ground. Lastly, while it is within walking distance of the beach playground, but if you have an older child who wants to be on the playground while a littler child plays in the water you will be stuck. They are too far apart and you can not even see the playground from the splash pad. Okay, so all that being said, it is really cute and will certainly be on list of things to do in a pinch. 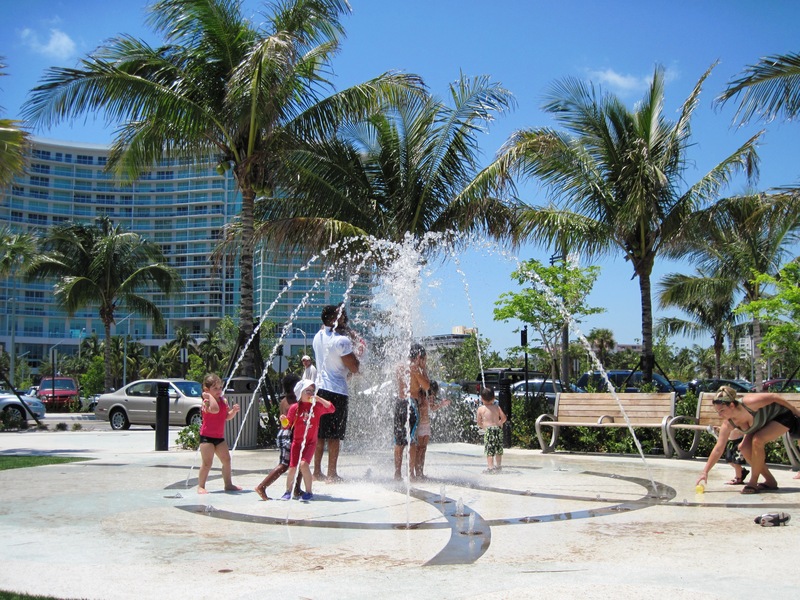 This entry was posted in Events and Reviews, Summer Picks, Uncategorized, Water Play and tagged Kids, Pompano Beach, South Florida, Splash Pad, Summer Activity by Cynthia Buckley. Bookmark the permalink.